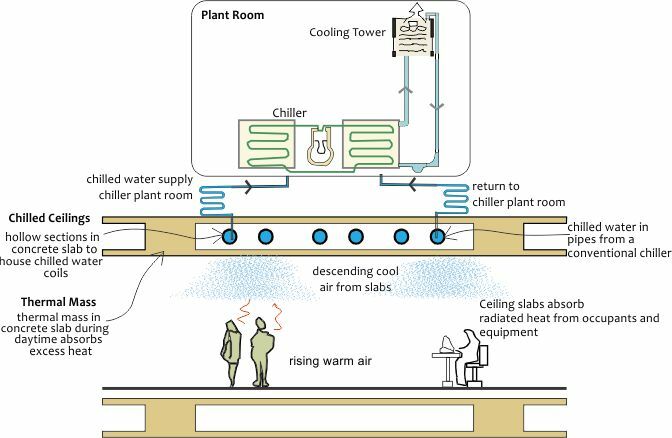 Schematic diagram of a radiant cooling system. Pipes embedded in the structure cool or heat the thermal mass of the building generally during the hours when it is unoccupied. 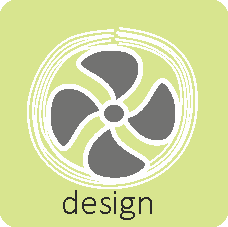 For cooling, radiant systems use both thermal mass and nocturnal cooling. Chilled water in the pipes can be supplied through a conventional chiller. Guiding principle of a conventional air conditioning system is convection whereas in a radiation system, the guiding principle is heat transfer through radiation. Heat transfer predominately occurs through surfaces like floors, ceiling, or wall which in turn are heated or cooled by embedded coils. Radiant systems are installed in combination of large thermal mass to facilitate absorption and radiation. For optimizing performance of the systems, coils should be installed in floors for heating purposes, and in ceiling for all cooling purposes. Application of radiant systems is limited to areas which have high latent load and chances of air leakage from humid areas are high. Improperly installed systems can lead to condensation on the building structural elements. Chilled slabs: These deliver cooling through the building structure, usually slab, and are also known as thermally activated building systems. Ceiling panels: These deliver cooling through specialized panels. Systems using concrete slabs are generally cheaper than panel systems and offer advantage of the thermal mass while panel systems offer faster temperature control and flexibility. Capital expenditure of this system is the same as a high efficiency chilled water system; however, operational expenditure is less than the chilled water system. Radiant cooling systems consist of coils embedded within the structure. These coils carry chilled water generated either through conventional electric chiller systems or low energy chilled water generation systems like absorbent chillers, desiccant chillers. Chilled water in the coils cools down the slab or panels which in turn act as heat sinks for sensible heat loads of internal spaces. Concrete structures typically used with radiant cooling systems also increase the thermal mass of buildings. This introduces inertia in the structure against temperature fluctuations and allows it to absorb heat from internal spaces. Additional savings due to lower supply temperature of chilled water (about 7-9 °C lower) Condensate formation on the cold radiant surface results in water damage, moulds etc. The two symmetric half of the buildings are air cooled with different technology. A conventional cooling system is implemented in one half whereas the other half is cooled by radiant system. Radiant system was designed for a cooling output of 75 W/ m2. Chilled water design temperatures for supply were 14 °C and for return 17 °C. Cooling tower approach temperature is 2 °C. Low pressure piping and ducting distribution system is installed. Energy recovery is also installed to provide dehumidified air to offices. System Performance Energy index for radiant system was 25.7 kWh/ m2. compared to 38.7 kWh/ m2. Thus, efficiency of radiant system was 33% less than the conventional system. Average chiller plant efficiency for the radiant system side was .45 kW/ TR compared to .6 kW/ TR. Quantity of water required by the radiant system is one fifth of that required by a conventional chiller of similar capacity. Air quality is also improved as there is no recirculation, so contamination is reduced. Comfort conditions measured inside the building are within the permissible limits of ASHRAE 55-2004 and ASHRAE 62.1-2007 for most of the time. Building has been operational for the last 3 years and the radiant system is functioning without any major complaints.